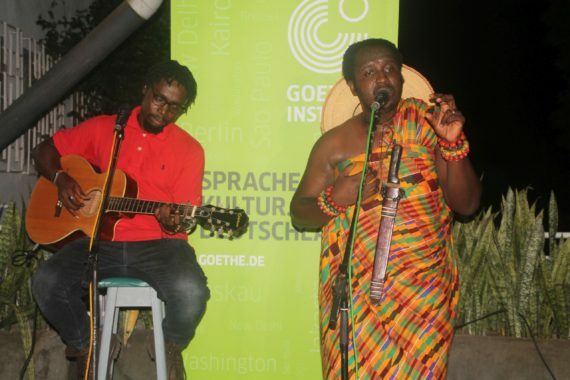 Acclaimed Ghanaian poet / literary coach Nana Asaase virtually stunned a capacity crowd at the Goethe-Institut in Accra with a non-stop performance of several inspirational poems that captures the essentials of life. 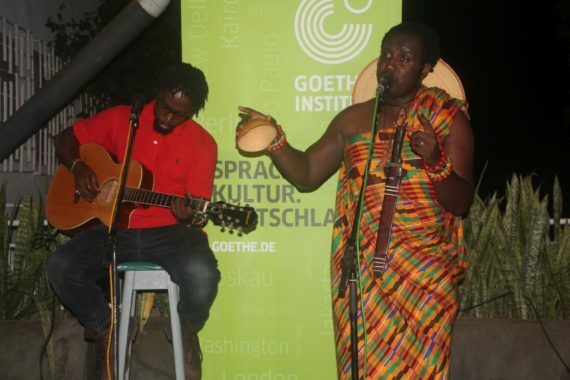 Accompanied by guitarist Hashmullah, Asaase’s prolific voice forcefully transmitted his messages, which ranged from politics, love, hope, divinity, Africa to tradition to an audience that practically expressed their deep interest with rapt attention. 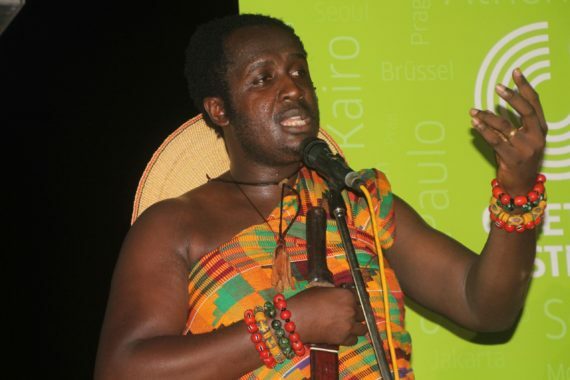 Clad in a colourful kente cloth wrapped around his body, the poet began with a memorial to the late Emeritus Prof J.H. 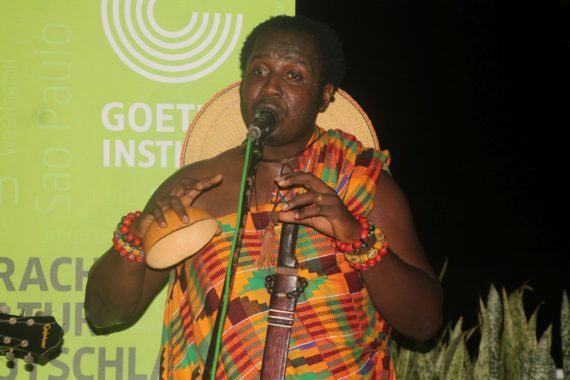 Kwabena Nketia, who died early in the morning by capturing his contributions to the development of music in Ghana, Africa and the world at large. 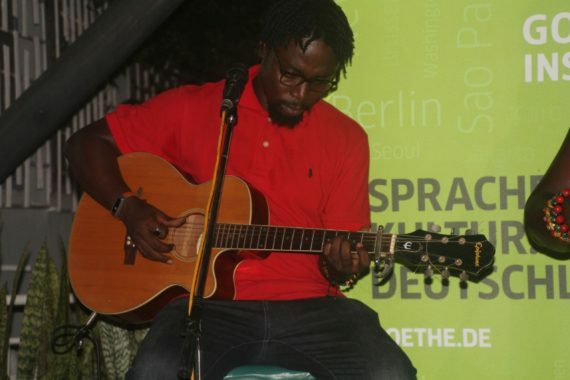 Decked with a traditional sword and a calabash in hand, Asaase gave a compelling rendition of touching, witty and sharp poetry as tranquil guitar riffs helped transform the performance into a dramatic blend of poetry and music. 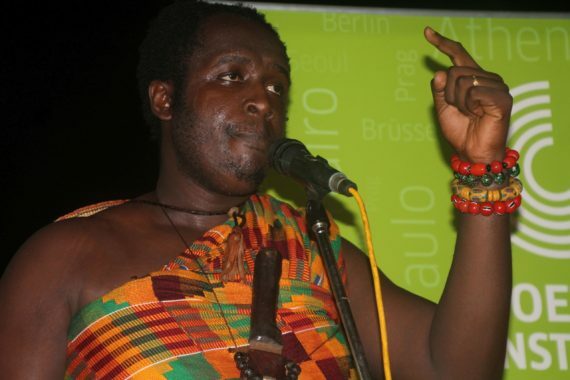 “Asaase is an astute performer – undeniably, he has a very smart way of entertaining his audience while creating a forum for intellectual encounter and contemplation. 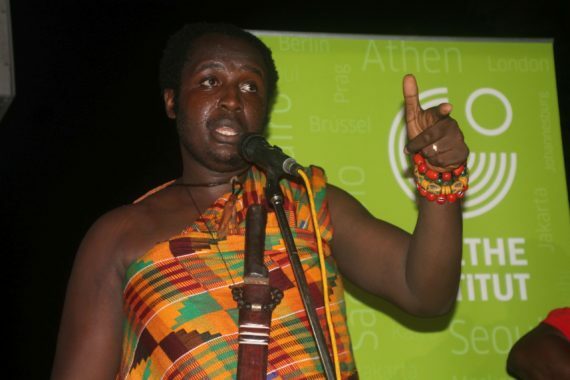 We need to support and encourage this style of approach to poetry performance”, said Yaw Owusu, a musician in Accra. 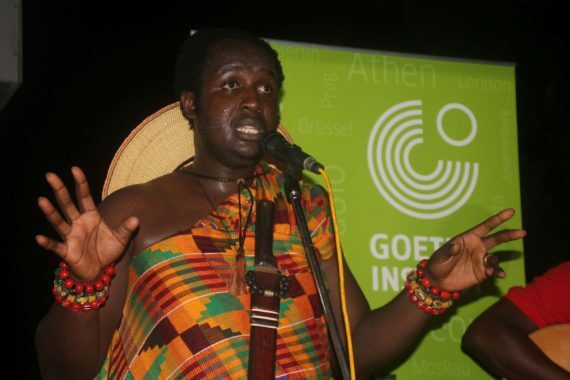 Rendered largely in English and Twi, the audience was treated to thought-provoking by Asaase, whose honesty, humor and story-telling prowess, has won fans across Ghana and parts of Europe. Indeed, his ability to capture the universal truths of a story we all know and love, has endeared him to the hearts of his fans. 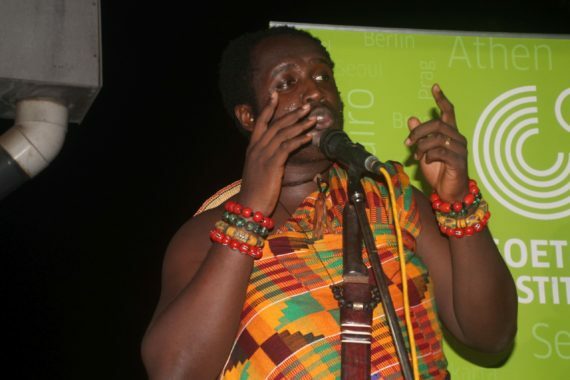 Asaase, who aspires to be one of Africa’s greatest literary evidences of the world, has performed to enthusiastic crowds and held workshops and master classes in various parts of Ghana, the United Kingdom and other parts of Africa. 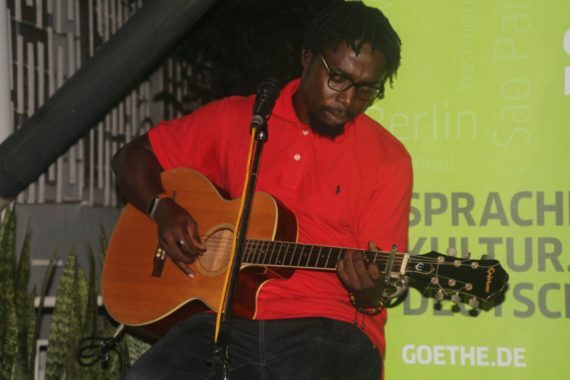 The performance forms part of monthly acoustic sessions dubbed “Goethe Abansoro”, which offers artists and their audiences a cozy atmosphere on a decorated terrace to interact while enjoying music, poetry or both.